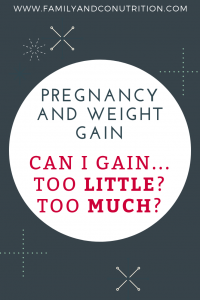 Why do we care about weight gain during pregnancy? 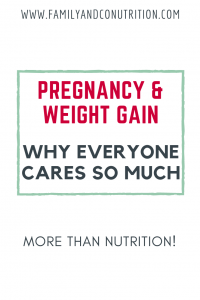 Weight gain is the “best” indicator of a healthy pregnancy and adequate baby growth. It is not the only measure your doctor or midwife will measure, but it is probably the easiest and quickest one to measure! 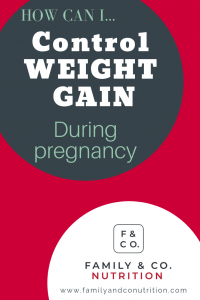 Weight gain is an easy measure to keep track of how well your pregnancy is progressing. So, how much should you gain? We spend our time saying that we don’t control our weight, but that we do control our choices and lifestyle behaviour. So much pressure is put on something that we have very little control of: your body weight. Recommendations by Health Canada are based on your pre-pregnancy body mass index. You body mass index (or BMI) is simply a relationship between your weight and your height, and although imperfect (mostly at the individual level) it might be an indicator of your disease risk associated with excess body fat. As you become pregnant, your BMI loose its value (there is another human in there accounting for extra weight! ), so the recommendations are based on your pre-pregnancy BMI category. 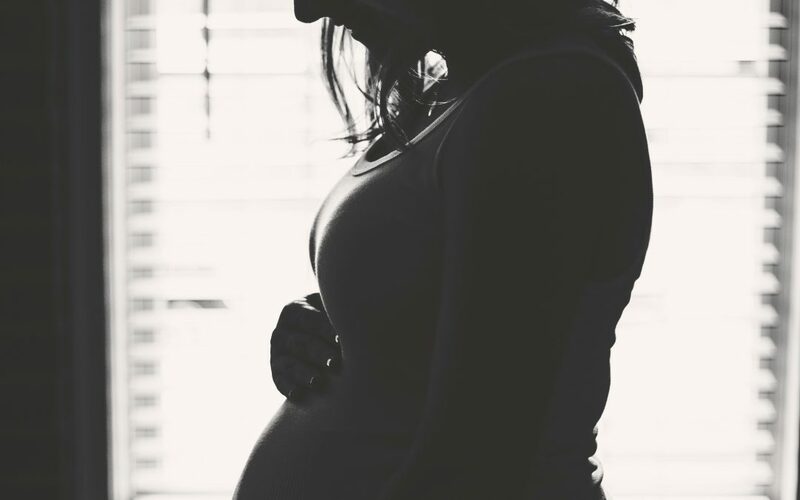 Health Canada recommends a total weight gain for your whole pregnancy, as well as a optimal rate of weight gain in the 2nd and 3rd trimester is suggested. 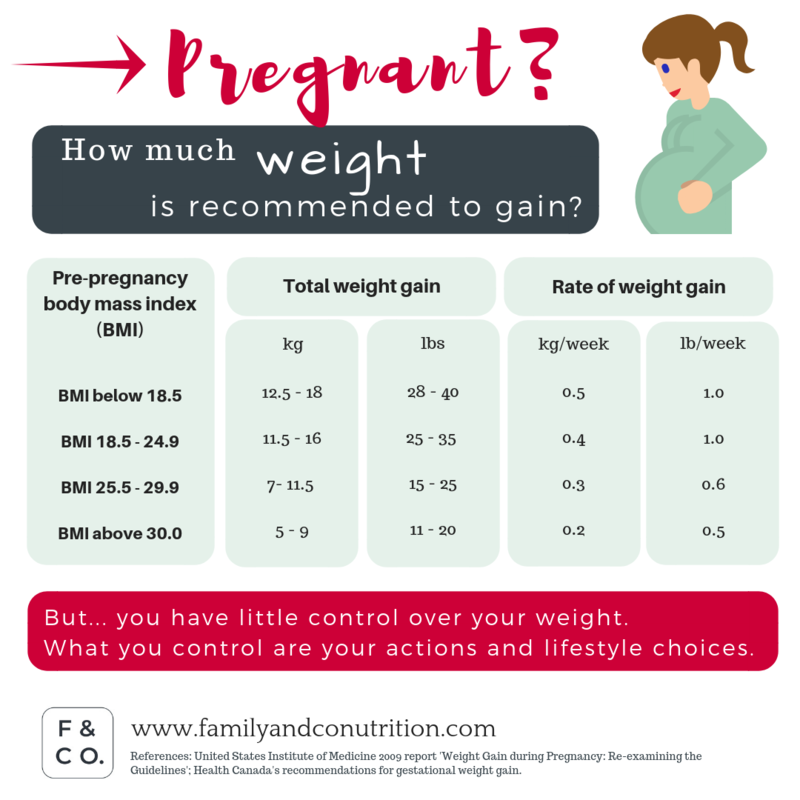 Based on your pre-pregnancy body mass index, Health Canada recommends specific window of weight gain during pregnancy. Weight gain: How is the weight distributed? Regardless of how much weight you gain or not, it is not going to be simply fat that you accumulate. It is more complex and subtle than that. You are creating fat reserve yes, mostly in your breasts, in order to support lactation. You are literally growing a new organ: your placenta. You are also increasing body fluids; increased blood volume to feed baby through the placenta, as well as amniotic fluid, both are vital for baby. And of course, there is the weight of your baby itself! In addition to the weight of your growing baby, the placenta, amniotic fluid, increased blood volume and energy store in your breasts constitute the weight gained! 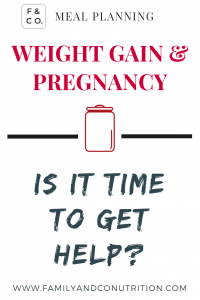 Weight gain: when can I expect to gain weight? Likely not a lot of changes will happen in the first 12 weeks of pregnancy. The fetus is still very small, not a lot of apparent changes have yet happened. Comes the second trimester, and it’s a different story! Baby is getting bigger, you might start to show, and your body is also adapting and preparing for the post-partum period! In general, we are looking for a steady weight gain throughout pregnancy, starting at the 2nd trimester. An apparent change in your body, including weight gain, is likely to happen starting in the second trimester or at the 13th weeks onward. Should I weight myself regularly? 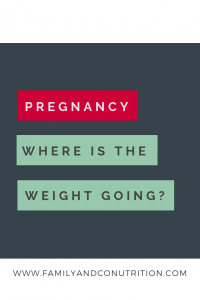 We don’t think anyone should own a scale… and that is also true for any pregnant women! We don’t recommend you keep track of your weight closely unless your health care practitioner indicates otherwise. 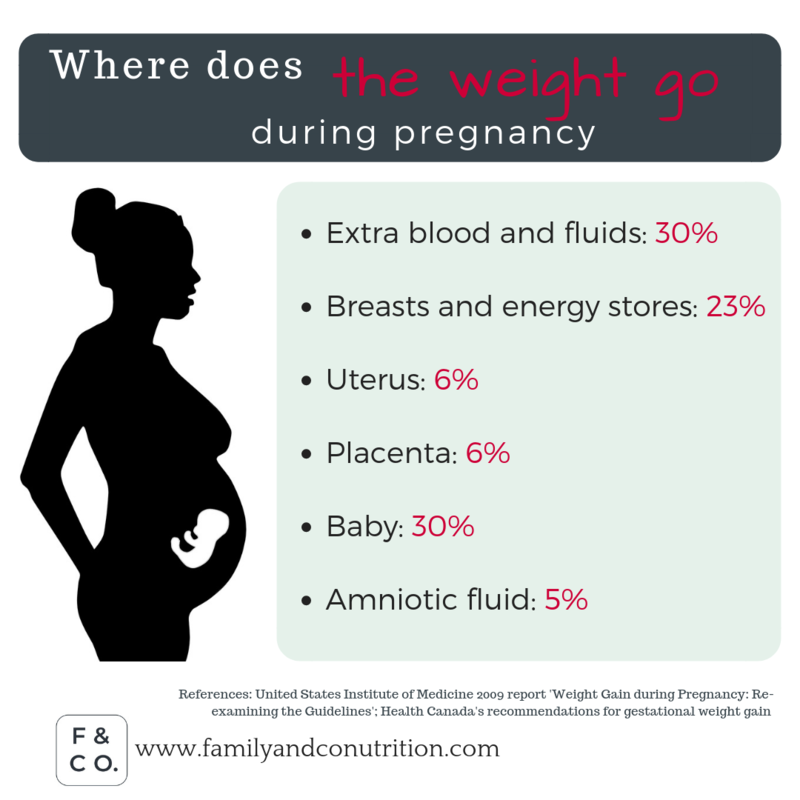 As you progress in pregnancy, your doctor/midwife is likely to weigh you and track your weight gain. That should be sufficient without you having to start weighing you at home. … Don’t you agree that this is already plenty? There is a lot of pressure on pregnant women to have this magical pregnancy, enjoy every minute of it, savour all the changes it brings (glorious hair and pregnant glow anyone? ), to control their body… It can have perverse effects (and we are not even talking about the post-partum period)! Stepping on the scale regularly can create an obsession with your weight, all these body changes and ultimately with food. Because society is constantly making us believe that controlling (most of the time losing) weight is a matter of willpower: eating less and moving more. But it is not as simple. Even less during pregnancy! Step on the scale only when your doctor/midwife asks you to; your energy is better put towards welcoming and accepting the body changes that come with pregnancy. 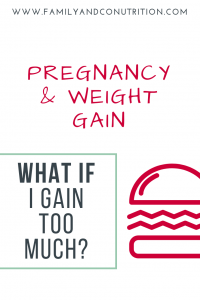 What if I gain too much or too little weight? Gaining too much or too little weight can indicate a problem. Similarly a regular weight gain with either a sudden surge or weight loss can indicate something is not quite right. Gaining too much or too little weight can be concerning for mom and baby. As usual, you know your body best. Anything feel abnormal? Are you concerned about something? Talk to your doctor or your midwife about your concern. Every pregnant women is different and will have her own rhythm of weight gain. Recommendations exist to guide us, but your health care practitioner clinical judgment and your values and concerns are also important in deciding which actions to take if your weight gain is not as anticipated. Every pregnant women is unique: your health care practitioner keep track of your weight to see how YOUR pregnancy progresses. Why does everyone feel the need to comment on your weight? Pregnant or not, our society is all about weight. It is the societal pressure to conform to this ideal (unrealistic) slim body. Sadly, pregnant women don’t catch a break. Either you gain too much, or too little, or lucky you are to not gain too much, or shouldn’t you worry that you are not gaining fast enough … someone will always have a comment. Although we don’t control what others say, one strategy is to have a prepared answer. 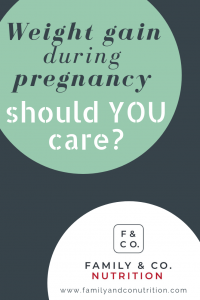 Something along “I appreciate you caring about how I might feel during my pregnancy, but I’d prefer focussing on something else than my weight”. … anything that is not-related to your weight, your look or anything that you don’t want to discuss. Weight-related comment, even with the best intentions, are not appropriate. Preparing an answer for such comment can give you a feeling of control and a way to avoid unpleasant discussions. So how can I control my weight? 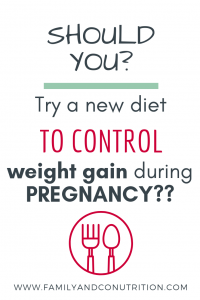 Even with the best intentions, you will not control your weight (and likely not your body anymore) during pregnancy. It is hard to wrap our heads around this concept, but so many things are changing and so many factors can influence your desire, aptitudes, capacities and efforts to even adopt or maintain a healthy lifestyle. We don’t control our weight, but we do control our actions and lifestyle. For sure, it is (always) a good time to adopt a healthier lifestyle, to assess your family habits and make changes. But it is also true that it might not be the best moment for you to do such changes. Perhaps you even need to slow down and catch your breath. YOU only know what is best for you at the moment. There is little you can do to control your weight. What you control are your choices and only YOU know what is best for you, your baby, and your family. For sure, it is not the time to dream of a weight loss! Gaining weight during pregnancy is expected, healthy and normal. It is not the time to adopt a drastic diet, cut food groups, count calories, and hope for a weight loss. Is it a good time to reflect on your expectations about weight gain, body changes and body image. It also holds true for the post-partum period and the pressure to get back into shape, lose the baby weight, and put these skinny jeans back on! 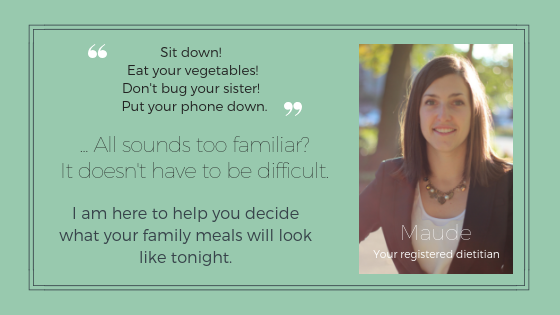 If you have concerns or you are not satisfied with your body and the changes that pregnancy brings, a registered dietitian can help you. Rasmussen KM, Abrams B, Bodnar LM, Nancy F, Catalano PM, Siega-riz AM, et al. Recommendations for weight gain during pregnancy in the context of the obesity epidemic. 2015;116(5):1191–5. Kapadia MZ, Park CK, Beyene J, Giglia L, Maxwell C, McDonald SD. Weight loss instead of weight gain within the guidelines in obese women during pregnancy: A systematic review and meta-analyses of maternal and infant outcomes. PLoS One. 2015;10(7):1–22.